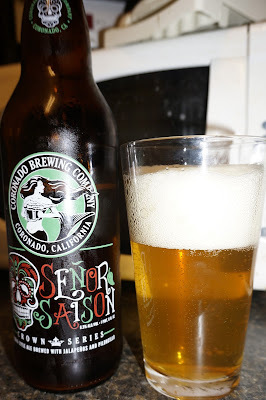 Coronado Señor Saison - AoM: Beer et al. 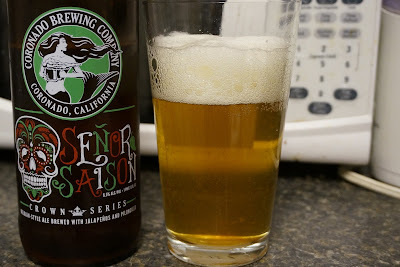 The Señor Saison definitely had a spicy jalapeno taste, but I wasn't sure how much I enjoyed it. Just south of our brewery, Baja California's burgeoning spirit of craft brewing reminds us a lot of our own with Mexican brewers looking to make a name for their region. We've enjoyed keeping an eye on the exciting new beers coming out of Tijuana, Mexicali, Ensenada and Valle de Guadalupe, and celebrate the rise of craft beer south of the border with this reimagined farmhouse ale. Brewed with agave nectar and jalapeño peppers, it combines a touch of spice with fruity esters derived from Belgian yeast. Like the brews of our cross-border amigos, this cerveza takes craft to new and interesting places.